Goodbye Best Friend | Travel Musings • Yummy Insights • Join me on my tasty journey! On that cold, pre-Christmas day 6 years ago I knew the moment I saw the shivering English Setter in the back of the Eastgate Humane Society’s kennel that he and I would be friends. Among a sea of barking, whining agitated dogs, he quietly and patiently sat – as if waiting for my arrival. I hadn’t planned on finding a new dog yet. It’d been less than six months since I’d sat with my German Shepherd, Buddy, as he took his last breath amidst our summer-lush backyard. Within the hardy fuchsias and blossoming gladiolas he left to chase an endless supply of squirrels in the doggie great-beyond. My trip initially was for holiday trimmings. My 12-year-old son and I hopped in our SUV that morning heading out for tree-farms unknown east of the city. However as we exited the city in morning’s still-early night, I must have subconsciously noted the Human Society’s sign to my left, and without hesitation (or intent, for that matter), my gas-guzzling four-wheeler made a line directly for the Center’s parking lot. We wandered in among kennels of the sad, the hyper and the loud – and found amongst this canine sea a beacon of sweetness: Baker. The papers clipped outside his cell told a story of a dog who was loved, but given up – not once, but twice. “Friendly, sweet and loving” were traits I needn’t read, but could see in his eyes. “Cat friendly” was the icing on the canine cake! A part of me had to wonder if it’d been luck or timing that had brought him in just the night before, and me on this morning. Once introduced officially by Center staff, I new Baker and I would fit well together. Baker’s first trip to see ‘Dr. Jim’ (the vet) was uneventful (“All’s well with this pup!”), but memorable. Maybe Dr. Jim told all of his patients that he’d “never seen a dog bond so quickly and thoroughly with an owner” before, but I certainly felt he was sincere in noting what I deeply felt. After just a month with my new best friend Baker, I felt a need to try to connect with his previous owner. My pile of papers from the Human Society, even those from his AKC registration, of course left out details of this. My thought immediately turned to the ‘Rant and Rave’ section of the local newspaper. 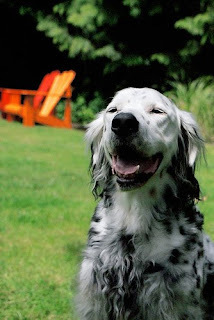 Within moments my rave was crafted: ‘To the selfless previous-owner of Baker, the English Setter: I’m sure it was a difficult decision for you to give him up, but thank you! He is the perfect addition to our family.’ Within the week this was printed in the paper (and of course immediately posted on my fridge). Some part of me knew those who had shared Baker’s earlier life would see this and smile. After six years and endless hours of side-by-side walks, beach-side frivolity, attentive squirrel-chasing and odd eating habits gone (ever known a dog to refuse meat? ), I spent the day reflecting on a life with Baker, and what a life without him would bring. I poured through photos of energy, fun, envy and smiles as I remembered what love my best-friend had brought to me. These memories gave me the strength to sit with Baker as I said my finally ‘goodnight’. His ear became the first thing my tears touched as he took his final breath. Through celebration, divorce, sickness and mourning Baker was my constant friend: his tail-wagging greeting at day’s end, as if having pined-away for me through the day, brought happiness to me even after the most difficult of days. I’ll have another best friend, but I’ll never find another Baker.